San Francisco — San Francisco based Kate Eric is a decade-old collaborative identity comprised of Kate Tedman and Eric Siemens. 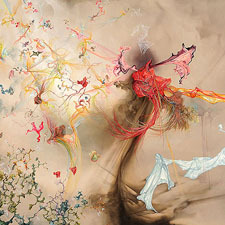 The artists have shown with Frey Norris since the gallery first opened in 2002, but “Never Even” will be their first exhibition in the new 5,100 square foot Jessie Street location, comprising some sixteen new paintings, including a 17 foot canvas reminiscent of epic war paintings, but unfolded on a cosmic or microscopic scale. “Never Even,” refers to the nature of physical and relational imbalances and how they create systems of movement, often leading to an inevitable “creative destruction.” Creative destruction here refers less to the familiar economic sense of the term, than to a psychological and sociological play on it. Human behaviors and motives are easily imputed into the art, perhaps revealed to be impersonal systems of causation themselves. Individual figures display both symmetry and imbalance or further distended in the monstrous heads of the “No, No Uncle” series. The fighting, eating and copulating aspects of dynamics in the paintings display themselves in vibrant primary colors, chitinous dense white and dazzling details, applied washes of smoky acrylic contrasting with surgically precise syringe-applied notations on the creatures’ skins. For the first time, vaguely furniture like elements seem to have been co-opted by biological processes. Kate and Eric’s backdrops for such theatrics are other-worldly landscapes depicting either minuscule molecular-like interactions or seemingly quite the opposite—the dynamics of the cosmos and the universe. The artists’ understanding of the world deems these two major forces—the micro-molecular and macro-cosmic—to have similar and parallel laws; they also consider that human interaction, often viewed as an infinitely complex psychological tangle, can be reduced to those same vectors, forces, and masses operating in physics. 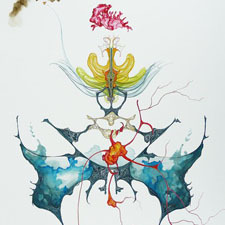 The artists are currently the subject of a solo exhibition, One Plus One Minus One at the Aldrich Contemporary Art Museum from June 26th through December 31st, 2011. Kate Eric have been reviewed and featured in ARTnews, Art in America, the San Francisco Chronicle and other publications. They have exhibited in Europe, the Middle East, Asia and the U.S. and their art is included in numerous public and private collections throughout the world, including the de Young Museum in San Francisco. A catalogue published by the Aldrich Museum of Contemporary Art is available from the gallery, with an artist interview and essay by Aldrich curator Monica Ramirez-Montagut.